DRINK SPECIAL! 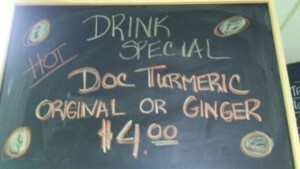 DocTurmeric in Original or Ginger for only $4! Limited Time! DocTurmeric is an organic, tasty turmeric drink available in three different flavors: original, ginger, and orange. It is gluten free, dairy free, soy free, and non-gmo. Made and bottled in Lenexa, research has shown that turmeric can: lower inflammation, alleviate arthritis, reduce chronic pain, boost the immune system, improve brain health, enhance longevity, fight symptoms of aging, slow the progression of Alzeheimers*. *This statement has not been evaluated by the Food and Drug Administration. This product is not intended to diagnose, cure or prevent disease.